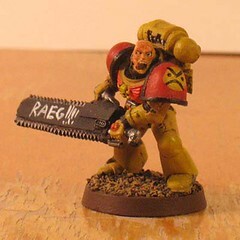 I have been waiting for awhile for the new Space Wolves codex, and now that it is out I have been working on a tournament-legal Angry Marines army. I currently have 1500 pts of this army, and hopefully after the holidays I can build a 2000 pt list. As soon as I get ahold of a camera I can show the models that are built and painted so far, and as I finish models I can add more pics. critiques and ideas are always welcome. That sounds fantastic and I'm sure we'd all love to see it. Good luck with all the yellow though, its a tough color to work with. here we go, got a camera and got some photos to share! here are the painted models so far. I used these three to test out colors and painting techniques. I like how they turned out and I look forward to painting the others! the first of my squad leaders, Angry Alan. he is armed with a pistol and a "frost blade". 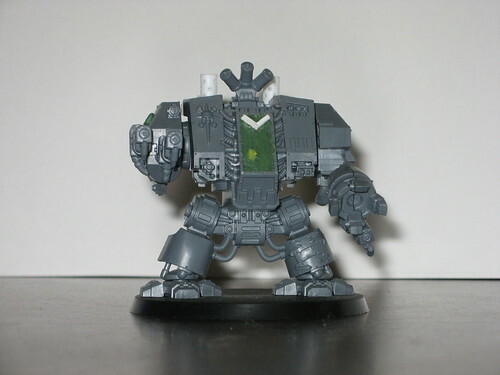 I wanted him to have an eviscerator, but the space wolves codex didn't have the option. all of my squad leaders. can't wait to paint them! and finally, we have Dirk the Jerk, the one model that isn't fully built yet. 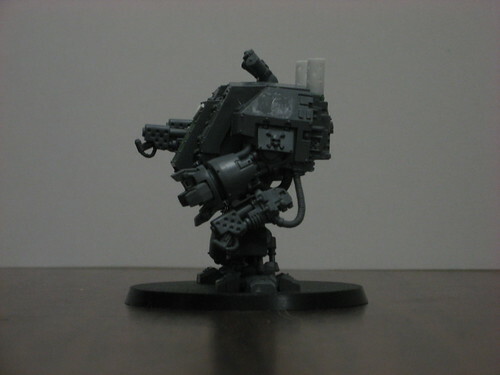 Equipped with twin-linked heavy flamer, another heavy flamer, storm bolter, and smoke launchers. 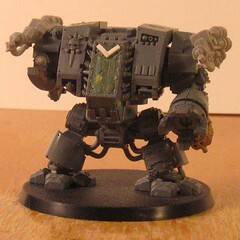 still need to find a suitable heavy flamer for the right arm and smoke launchers. so that's my army so far! I plan to make some progress with painting this Thanksgiving break, when I can get ahold of my paints from back home. Again, feedback is very much appreciated. I like this one. 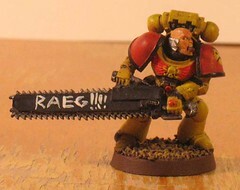 The writing on the blade takes the cake though! 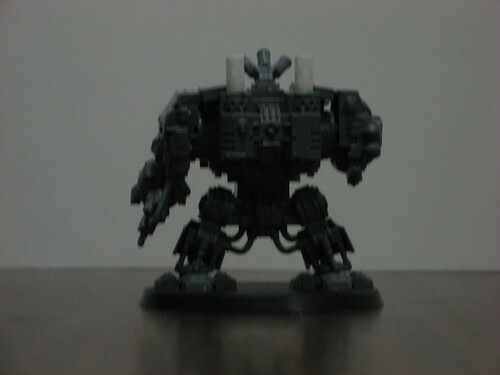 I finalized his stats to have a twin-linked heavy flamer, a normal heavy flamer, smoke launchers, and extra armor. I have already tested him out, and when he is deployed in a drop pod he is a wicked distraction! any last thoughts or ideas before I start painting Dirk? These are turning out great. I can't wait to see Dirk painted. considering that you are using Space Wolf rules I'd love to see your take on thunderwolves. 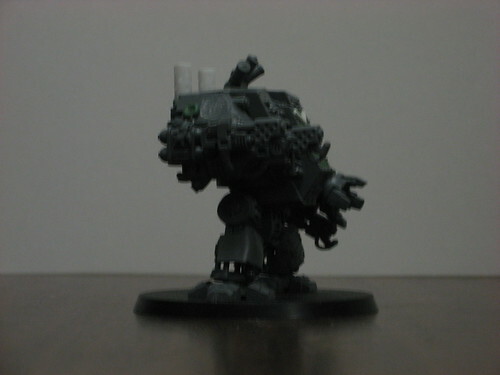 I have actually been on the fence with using certain options and units of Space Wolves. although if I do use thunder wolf cavalry I was considering having them ride wild boars, and I could use the fantasy warhammer orc boar riders as a base. Yeah, I was a bit on-the-fence about the thunderwolf cavalry too. But they are kind of growing on me. I like bikes already and they seem to work a little like them. Well if you do end up making some, it'd be interesting to see them. 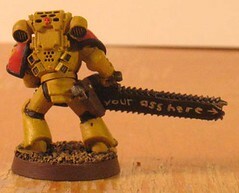 I believe i saw these posted on Dakka Dakka at some point, correct? 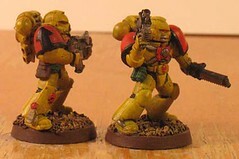 Q: Have you tried using a light wash of orange to reduce the rather muddy quality of the yellow? 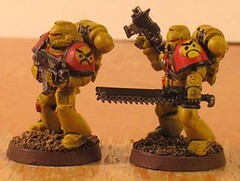 It would also make their armor more like that of standard ANGRY marines. It's also possible that it's simply the lighting. I would greatly appreciate it if you took more pictures of the models in a different lighting area whith as little shadows as possible. And to answer some questions, it is the lighting that is giving their armor the muddy yellow look. Once everything is painted I will be photographing these guys in a photo studio setting instead of on my desk with a couple lamps! 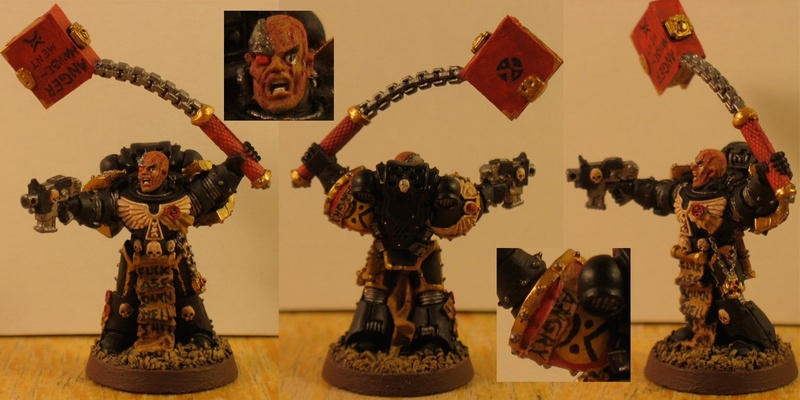 And yeah, I am posting these pics on the DakkaDakka forum too, as well as directly to /tg/ (where I got feedback on the Chaplain before I built him). That way I can get more responses from more folks on this ongoing project. 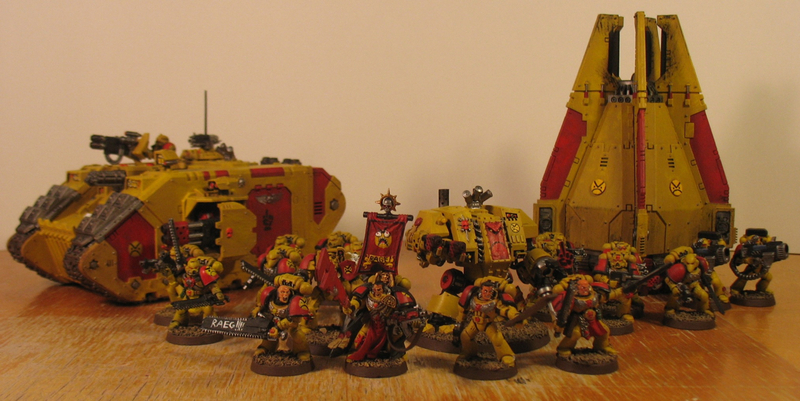 Also I think that I will continue to use Space Wolves rules until the Blood Angels codex comes out later this year. 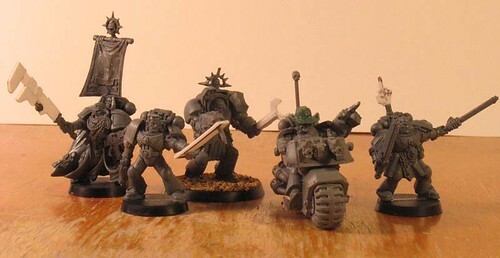 I have heard that this new codex can more accurately portray Angry Marines, so we'll see when it comes out! That's all I got so far for ya! Next up will be all my Fast attack and Heavy support choices!